The GX1 high-pressure valve is a complete re-design of Proportion-Air’s successful GP product. With this re-design, we greatly improved the accuracy, resolution and repeatability of our high-pressure control valve. 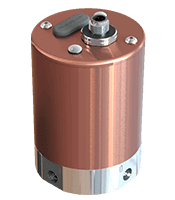 The GX1 high-pressure valve is 50% less weight (with non O2 cleaned GX) than the GP. The GX1 can also be used to pilot a volume booster and achieve much higher flows with the same great accuracy. The GX1 high-pressure valve has several other unique and beneficial features. An on-board split power supply allows true zero for command and monitors even though the GX is powered by a conventional single-ended power supply. The GX1 utilizes advanced on-board power management hardware to minimize current draw and heat build up. The GX1 also features status indicating LEDs for power and TTL. The TTL signal is a conditional on/off signal to use for diagnostic purposes. This signal is LOW when the pressure is within 1% of final setting. The GX series can be paired with a variety of high-pressure volume boosters for even greater flow. When using a volume booster, the GX2 can be used to achieve accuracy similar to the GX1.